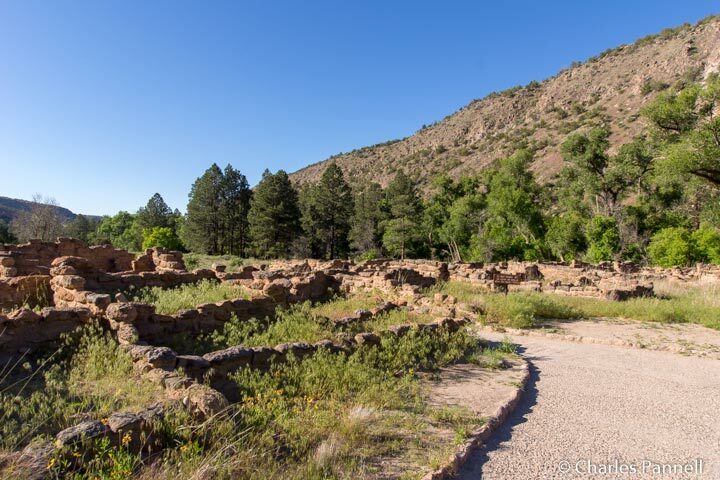 Located in Northern New Mexico, Frijoles Canyon was once the home of the mysterious Anasazi or “Ancient Ones”. These agrarian people arrived in this fertile area around 1150, and departed some 400 years later when they presumably depleted their natural resources. I say presumably, because the Anasazi had no written language, but we do have scientific evidence of a drought near the end of their residence. These ancestors of the present day Pueblo Indians constructed cliff dwellings that were carved out of the volcanic tuff; and today remnants of this lost civilization are visible throughout the Southwestern U.S. One of the best places to see these excavated communities is at Bandelier National Monument, located on a remote stretch of land in Northern New Mexico, just a short drive from Los Alamos. Named for prominent archeologist Adolph Bandelier, the ruins were discovered in the early 1900s, and set aside as a national monument in 1916. Today, in an effort to lessen visitor impact during the peak season, private vehicles are not allowed at the site between 9 and 3 from May to October. During that time, accessible shuttle buses transport visitors from the White Rock Visitor Center to Frijole Canyon. That said, anyone with an accessible placard can drive to the site throughout the year. Even if you don’t have a placard, you can still drive to Bandelier before 9 a.m. during the peak season. The site opens at sunrise, and to be honest it’s a more ethereal experience before the shuttle bus crowds arrive. 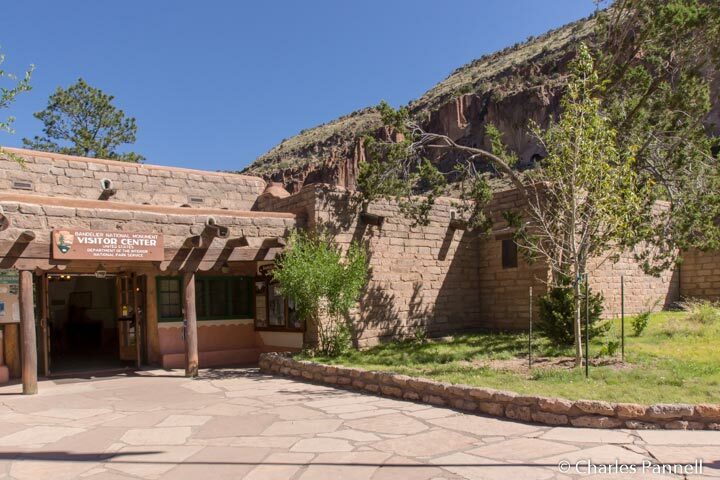 It’s easy to find too, just take NM 4 to the monument entrance, and then follow the signs to the Frijoles Canyon Visitor Center. Accessible parking is located close to the visitor center, and there’s an accessible restroom next to it. Although the visitor center doesn’t open till the shuttles begin to run, it’s worth a stop after you visit the ruins if you arrive early. The accessible trail to the ruins begins just behind the visitor center. The quarter-mile paved trail is level, and although there are a few uneven patches it’s still very manageable for wheelchair-users and slow walkers. It passes by the remnants of the big kiva — which was used for religious ceremonies — and winds over to the ruins of the Tyuonyi Pueblo. This excavated village was at least two stories high and is believed to have contained 400 rooms around a central plaza. At one time it likely housed about 100 people. Some slow walkers may be able to access the pueblo, but technically the accessible trail ends here. 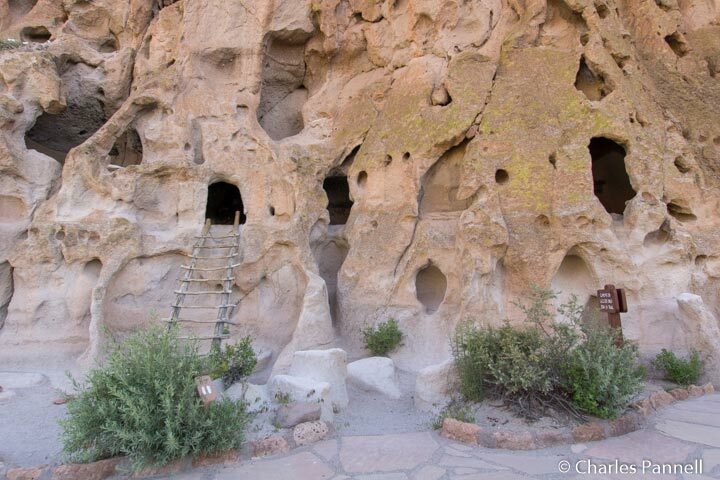 The Bandelier experience, however, does not end, even though the physical access does. Take some time to gaze up at the cliff dwellings on the hillside. Although they are only accessible by ladders, the panoramic view of the community is spectacular. Take your time and linger on to fully enjoy the experience. When you hear the sound of visitors alighting from the shuttle buses, you know it’s time to depart. There’s nothing more magical than an early morning visit to this ancient — and mysterious — community.